Despite David Malouf's An Imaginary Life not being set in Australia, or having Australian characters, it should be considered as a great Australian novel, writes Dallas J Baker. … further from the far, safe place where I began, the green lands of my father’s farm, further from the last inhabited outpost of the known world, further from speech even, into the sighing grasslands that are silence … (David Malouf, An Imaginary Life). 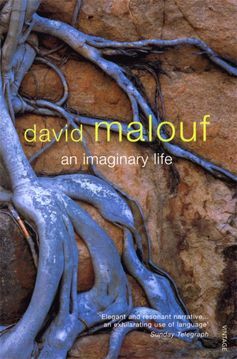 David Malouf’s An Imaginary Life is not set in Australia and has no Australian characters. It is set at the edge of the Roman Empire, in the first century AD. Australia as “Australia” would not exist for almost 2,000 years. This lack of identifiably Australian components is probably why An Imaginary Life is rarely mentioned as a great Australian book that deserves more attention. An Imaginary Life is exceptionally well written, rich in poetry and evocative detail. It is a work reminiscent of the writings of a mountain hermit or nature mystic – but that’s not why I selected it as the one Australian book that deserves more attention. I selected it because its central themes resonate with ongoing debates about what it means to be Australian. What kind of Australian literature is this? At first glance, Malouf’s second novel does not look like an Australian story at all. It doesn’t strongly feature the Australian landscape or sense of place, nor does it offer us characters of the type we have come to expect of typically Australian writing. There are no larrikins, no diggers, no Aussie battlers, and no tough yet world-wise women with hearts of gold. To me, though, it reflects a significant aspect of the Australian story – a sense of exile. An Imaginary Life tells the story of Ovid, the most famous and most irreverent poet of imperial Rome. Ovid’s irreverence leads to his banishment to an isolated village on the shores of the Black Sea in current day Romania, a place occupying the literal edge of the Roman Empire. Exiled to the limit of the known world, Ovid is cut off from his own culture, even from his language. Slowly, the poet learns to depend on and respect those around him, those he once saw as unsophisticated barbarians because of their inability to speak Latin, their poverty, and their closeness to nature. Ovid sees nature as something somehow frightening, wild, unless it is cultivated, transformed and made productive by human hands. His worldview is challenged when he encounters an untamed boy who has lived out in the wilderness with wild creatures. Ovid captures and tries to “civilise” the boy – but this backfires on the poet in unexpected ways. By observing the wild boy, and then following him into the wilderness, Ovid realises Rome is not the whole world, and not even the centre of it. Ovid’s predicament should be familiar to many Australians. Like the poet, many of us are acquainted with the feeling of being at the edge of things, on the wild borders of regions and empires to which we do not quite belong, or do not belong any more. For the first century or so after colonisation, Australia was on the periphery of the British Empire. Then, from the second world war to the 1990s, we understood ourselves to be on the outer limits of the USA’s sphere of influence. Now we see ourselves as on the edge of the Asian region, but not really part of it. We seem to always be a part of something and yet apart from it. When non-Indigenous Australians think about the history of their belonging to this place, they inevitably come to a moment of arrival; either recent or generations back, either as free migrants, refugees or exiled convicts. They also come to a moment of departure from somewhere else, the places where their ancestors, or they themselves, once belonged. Indigenous Australians also know exile. European colonisation dispossessed them of their country. Over the decades that followed, many of them were forcibly moved to missions in places as foreign to them as the Old World. There is in Indigenous communities a deep yearning and mourning for lost places; places locked behind gates and fences, places buried beneath cities and suburbs, roads and farms. The somewhere else in our personal histories – those places we lost or left – plays a big part in how we think about ourselves. It produces a sense of national belonging that is never quite secure. A common response to that insecurity is a kind of aloofness, a standing apart from the rest of the world. We like to single ourselves out, to brandish our physical and cultural distance from other places, our un-belonging as it were, as a mark of uniqueness, and of national identity that distinguishes us from others. This is also Ovid’s initial response to his exile, to cling firmly to that which makes him different, to refuse to truly belong either to his community of exile or to Rome, which has cast him out. Another common response to this insecurity, that sense of un-belonging, is to turn to nature, to the environment. That may be why so much Australian writing has a strong sense of place, and why when we think of important Australian novels they are often ones that feature landscape as a character in its own right. Indigenous Australians have shown other Australians the way in this regard. It is their profound understanding and love of this place that has, over time, transformed the non-Indigenous view of it from something to be feared and tamed, to something to love and protect. Unfortunately, the landscape is still a contested space: the site of ongoing Indigenous dispossession, the site of mass species extinctions and environmental degradation. When we turn for a sense of belonging to the land, to the country, we are inevitably reminded of our un-belonging, or of our dispossession. Even so, nature, perhaps because it is undeniably a healing thing, continues to anchor us here, to ground us as “Australians”. For many, contested though it is, the beauty of the land eases that sense of exile, of not quite belonging, whether their families have been here for just a few years or a few thousand years. For Ovid, it is the same. Slowly he comes to see the wild world as something to embrace, to cling to even, rather than something to fear. Ovid’s great epiphany is that the untamed world is not a hostile place, but a new home where he can be free of the rigid structures of Imperial Rome. By venturing into an even further place, a greater exile, he becomes free. An Imaginary Life is, in part, about an individual journey from a state of being cut off and apart from the environment – of wishing to tame and exploit nature, of being totally entangled in language and culture – to a state of being in intimate contact with the untrained, wild things of the world. It is also about a poet, in thrall of civilisation, realising that there are other ways to live and experience; ways that are beautiful and fulfilling. Ovid comes to this realisation by following the example of the wild boy, someone for whom the environment is not something outside of himself but an expression of his own nature. Those themes – of belonging and exile, of how to relate to the environment and to those who are different to us – are core to the debate about what it means to be Australian today. An Imaginary Life does not provide a workable template for how to navigate the complexity of belonging and un-belonging, nor should it. It’s a novel not a policy document. It does, however, show us it is possible to imagine ways to do things differently, ways to live differently with each other and with nature. And once imagined, those other ways of living seem all the more possible. Dallas J. Baker is an Adjunct Research Fellow at Griffith University and an academic in Creative Writing in the School of Arts and Social Sciences at Southern Cross University. <Dallas J Baker does not work for, consult to, own shares in or receive funding from any company or organisation that would benefit from this article, and has no relevant affiliations. This article was originally published on The Conversation. Read the original article. Read more articles in The Case For series.